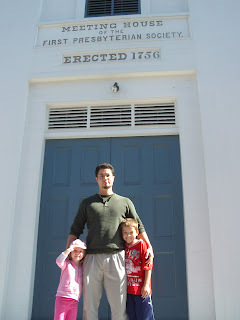 One of the blessings of living in New England is that history is right in our back yard. 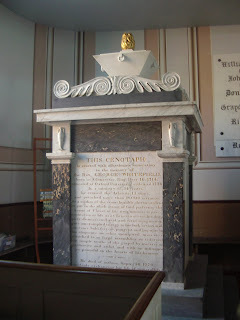 The great evangelist/preacher of the Great Awakening George Whitefield's crypt is buried in a church he founded in Newburyport, MA. I can't believe I've lived here this long without having visited it. So, today I decided to drive the 2.7 miles over to Old South Church and visit. 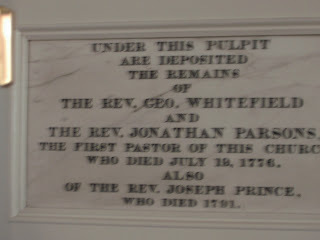 Though Whitefield never pastored at Old South, he was good friends with the first pastor there Jonathan Parsons with whom he is here buried (along with Joseph Mince, a minister who preached blind). 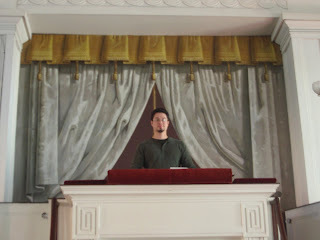 It was pretty stunning standing at the pulpit, which felt about 10 feet higher than the pews for the congregation, under which Whitefiled is buried. 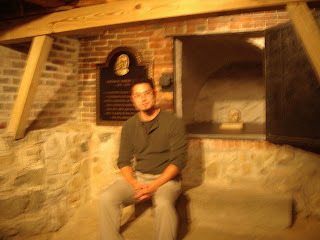 After that, I took a seat by the crypt itself in the basement (that skull behind me is just a mold as his real skull is underneath with the rest of his remains!). Of course Whitefield is in glory, awaiting the resurrection, and forgiven of all his sins through a mighty Christ, as he said, "What if thou hadst committed the sins of a million worlds? Christ's righteousness will cover, Christ's blood will cleanse thee from the guilt of all." hey! my name is chris geiger, i'm an elder at old south. i'm teaching a class on powerpoint at salem state and thought i would do a ppt for george whitefield and found your blog. feel free to swing by and visit again sometime. George is still there and so are we. would love to see you.